I have had this on my list for a while. Since I am not a dog person, nor a car person, I overlooked it until now. I have already recommended it to friends of the 2-legged variety (dog-owning, car-driving or otherwise) because it isn’t a dog story or a car story…it’s a life story. Enzo, a Lab-Shepherd-Doodle mix and the narrator of the story, would agree he is man’s best friend. When up-and-coming racecar driver Dennis brings him home as a puppy, their friendship and Enzo’s life lessons begins. As the mostly silent partner in the relationship, we are taken inside Enzo’s head to analyze the action taking place as Denny meets and marries his wife, Eve, and they add little Zoe and they struggle with the curves in their road of life. As the old boy ages, he looks back in this memoir of a 4-legged friend who is more compassionate then some humans, understands more than you realize, and looks forward to a applying the lessons he learned in a future life as a man. Enzo’s listens and learns from all his humans as well as the television, which Denny leaves on for him during the day. All this information will help prepare himself for his next life on two legs. As Denny shares his successes or losses on the track, and they review race video, his dog learns how the art of racing and navigating life lessons overlap. Humor of life as a dog is interwoven with these because, of course, a dog can’t know everything and be everywhere. The author cleverly inserts that fact into Enzo’s stream of consciousness as he tries to share with us what he has pieced together about life and about the story’s action involving his family for which he wasn’t allowed to be present. I am an audiobook reader and have recently discovered the art of downloadable collections from my local library. One of the reasons I enjoyed this book so much was hearing Enzo “speak,” given voice by actor Christopher Evan Welch (1965-2013); you are just listening to a friend share his trials and tribulations. I hope you will love it as much as I did, and maybe you will learn some lessons along the way that you can apply in your next life—as a dog. 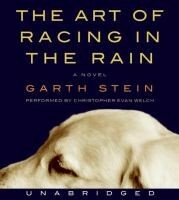 PS—Garth Stein, the author, has also adapted this for youth under the title Racing in the Rain. I really enjoyed the audio version of this book as well!